Do you have the Right tools to Access Clean Water in an Emergency? Introducing the Survivor Filter PRO, the only Virus Tested Water Purifier on the Market Proven to also Eliminate Bacteria, Reduce Heavy Metals and Filter to 0.01 Microns. - Replaceable Ultra Filters can be re-used up to 100,000 Litres before replacing. Replaceable Carbon Filter lasts up to 2,000 Litres. - Outer Shell Made of Military Grade BPA Free ABS Material. - The ONLY Personal Water Purifier that has an Ultra Filter Pre-Filter, a 0.01 Internal Ultra Filter, and a Carbon Filter! - Specially designed cap/cup fits on the unit and allows you to drink your freshly filtered water. - Handy Travel Bag allows you to take it anywhere. If you don't love your Survivor Filter PRO, simply return it and we will refund 100% of your purchase! Don't take Chances with Your Family's Safety. Click the Add to Cart Button to Get Yours Now! TRIPLE FILTRATION TO 0.01 MICRONS TO REMOVE VIRUS, BACTERIA, PARASITES and REDUCE MOST HEAVY METALS, TASTE and CHEMICALS: thanks to Dual Hollow Fiber Membrane (Ultra Filters) and Carbon Filtration - 20 times more efficient than the competition at 0.2 microns and none of the Competition Comes Close with Our Heavy Metal Removal. PLUS - SURVIVOR FILTER SATISFACTION GUARANTEE and LIFETIME WARRANTY: if you don't love your Survivor Filter PRO, simply return it and we will refund 100% of your purchase. 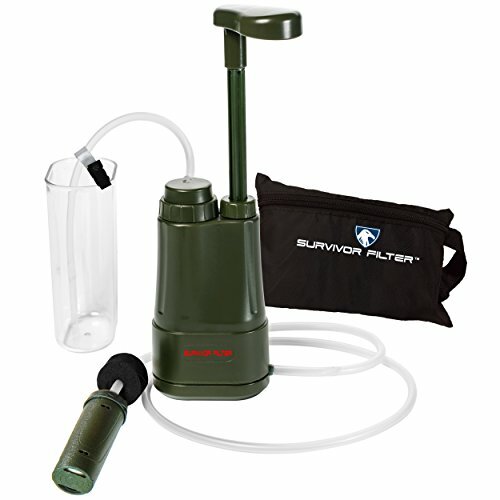 SURVIVOR FILTER SATISFACTION GUARANTEE and LIFETIME WARRANTY: if you don't love your Survivor Filter PRO, simply return it and we will refund 100% of your purchase. If you have any questions about this product by Survivor Filter, contact us by completing and submitting the form below. If you are looking for a specif part number, please include it with your message.